"First home of Dales Ponies in the USA"
If you are interested in purchasing one of the ponies shown below please write, call or e-mail for a current price quote. 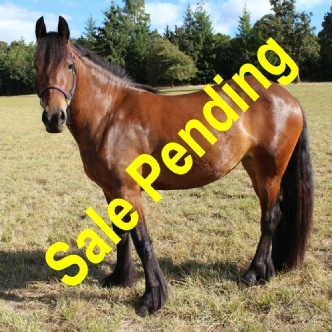 This is a well proportioned and energetic mare with excellent conformation. Anna is inquisitive and enjoys a good scratch but when she gets out in the field she is just full of jumps, kicks and go! Anna has white on both rear feet and is otherwise solid black. She had here first foal (Red Prairie Anna Bea) in 2013. Anna has been ridden a number of times and performs best when working hard. She is good at traversing obstacles and would do well in pack-work, or other farm/ranch activities. This is a people friendly young filly. She was sired by the gray stallion Dartdale Peter Boy and has his strong and powerful body style. At three years of age she has now been saddled and ridden. It will still be a year or two before she is at her adult body weight but she is now at her adult height. She is good natured with lots of spirit. 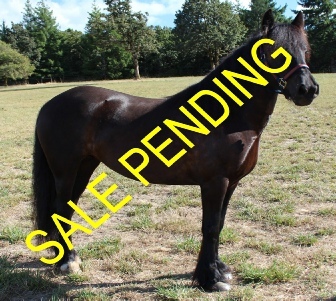 She is not jumpy and will be a good choice for trail riding and possibly cart work. Some photos have been altered to remove unwanted objects from the scene. No alterations have been made to any of the ponies.